Given Mitchell’s record and the mass destruction his party has wrought on this country, I think Schweikert has a better than even chance of winning the rematch. And, Arizonans haven’t forgotten what the Administration has done/is doing to them vis a vis suing them in Federal Court because the State had the nerve to start doing the job Obama has failed to do on their southern border. 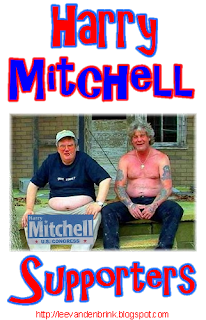 Harry Mitchell is winding down his second term in this House seat… and none too soon. Mitchell took this seat from J.D. Hayworth in 2006, and his voting record is no better than his Democrat colleague in AZ-1… his abortion record is almost as bad, and he voted FOR Health Care reform and FOR the Stimulus bill. CQ Politics has this race listed as a “Toss Up” and our Wiki source has this thing ranging from “Toss Up” to “Leans R” which is very encouraging for Schweikert.